Brenda Mae Tarpley (a.k.a. Brenda Lee and “Little Miss Dynamite”) was born to an extremely poor family in December of 1944. Things took a turn for the worse when her father, a onetime semi-pro baseball player and carpenter, died in a construction accident in May of 1953 when she was 8 years old. 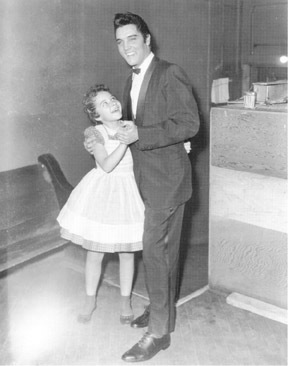 Within two years of this happening, the 10-year-old girl started taking over her deceased father’s role as the primary bread-winner of the family, with frequent performances on various TV and radio shows, as well as in record shops then her big break happened when she sang in front of future Country Music Hall of Famer Clyde “Red” Foley, who sold over 25 million records in his lifetime, a feat Brenda Lee would easily surpass. At the time, Foley was hosting a new show calledOzark Jubilee, a country music and performance show. Lee was a huge fan of Foley, so decided to go meet him as he was on tour promoting his TV show in her home town. Without them ever hearing her sing, a local DJ, “Peanut” Faircloth, convinced Foley and his promoter to let little Brenda open the show with one song, Hank Williams’ Jambalaya, which she added her own little twist to by speeding up the tempo and rapidly starting and stopping her voice during certain words of the song. (You can see a short bit of her performing this song when she’s 16 here or as an adult here, or a phenomenal mashup of a bunch of snippets of her early performances here). I still get cold chills thinking about the first time I heard that voice. One foot started patting rhythm as though she was stomping out a prairie fire but not another muscle in that little body even as much as twitched. And when she did that trick of breaking her voice, it jarred me out of my trance enough to realize I’d forgotten to get off the stage. There I stood, after 26 years of supposedly learning how to conduct myself in front of an audience, with my mouth open two miles wide and a glassy stare in my eyes… The way I stood back and enjoyed watching her work, I felt guilty for not going out to the box office and buying a ticket. Even though she was slated to just do one song, the crowd called for an encore and she performed three more before leaving the stage. Foley signed her that night to a 5 year contract and she became a fixture on his show, which became her platform for vaulting into super-stardom. Three years later, at the age of 13 in 1958, Lee recorded what today is the song she’s probably best known for (though she had numerous hits throughout her career), Rockin’ Around the Christmas Tree. The song was written by Johnny Marks who, despite being Jewish, wrote several hit Christmas songs besides that one (Rudolph the Red-Nosed Reindeer, Run Rudolph Run, A Holly Jolly Christmas, The Most Wonderful Day of the Year, etc.). Rockin’ Around the Christmas Tree mostly flopped upon its initial release, selling just 5,000 copies. The next year, they released the song a second time and it again flopped, selling just over what it did on its initial release. It finally started to gain some traction the next year as Brenda Lee’s fame began to skyrocket, managing to rise as high as number 14 on the Hot 100 Pop Singles list. Within 5 years of that, it went as high as number 3 on that same list. 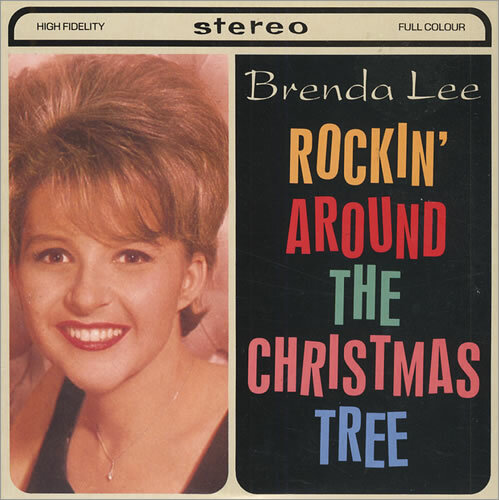 By the song’s 50th anniversary in 2008, Brenda Lee’s original version of it had sold over 25 million copies, including about 700,000 digital copies, making it the 4th most digital downloads sold of any Christmas single. Brenda Lee’s stage name was created by producer of Peach Blossom, Sammy Barton, in 1955, the same year of her big break. Barton thought “Tarpley” would be difficult for people to remember, so suggested she take the “Tarp” part off and just go by “Brenda Lee”. On the night of her big break, she ended up turning down an offer of $30 to perform on Peach Blossom and instead went to see Clyde Foley’s show that she ultimately performed at for free. Shortly before Peanut Faircloth recommended Lee to Foley, she was regularly performing at her step father’s record shop, Brenda Lee Record Shop, in Augusta, Georgia. At the shop, every week a radio show would be broadcast, hosted by Peanut Faircloth. Brenda Lee even wrote and sung her own theme song for the show: “Brother, if you want to get the lowdown, Come along and let’s all have a hoedown, At the Brenda Lee Record Shop Saturday at 3, On the Brenda Lee Jam-bo-reeeeeeeeeeeeee!” She also at that time sung at Jimmy Skinner’s Record Shop, which had regular radio shows broadcast out of it. Brenda Lee had 9 consecutive top 10 hits on the Billboard Hot 100 from 1960 to 1962. That consecutive top 10 record would stand for female artists until 1986 when Madonna broke it. The saxophone solo on Rockin’ Around the Christmas Tree was played by famed saxophonist Boots Randolph. When she was just two years old, Brenda Lee’s mother would take her down to a local candy store where she’d earn money and candy singing on a counter in the store. At the age of 5, Brenda won a talent contest put on by various elementary schools in her area. What song she sung in that contest is contested, but it is either Slow Poke or Take Me Out to the Ballgame. In that same event, she was runner-up in the beauty contest. It was from this contest that her career really started. After the competition, she was offered a gig singing on a local radio show in Atlanta, Georgia. She regularly sang on the show, but never got paid anything but ice cream for those performances; she was allowed to eat as much of it as she wanted. This show led to other places booking her, including a TV show, TV Ranch, which she wasn’t paid anything for either, this time not even in junk food. Brenda’s first paid job was for $20 (about $180 today) at a Shriner’s Club Luncheon. On April 24, 1963, at the age of 18, Brenda Lee married 18-year-old Ronnie Shacklett. The two met at a Jackie Wilson concert in Nashville. They are still married today, nearly 50 years later.